Our allies in the EcoWaste Coalition has recently introduced their new champion for chemical safety – The PCB Eliminator! He is the latest addition to EcoWaste’s own league of green heroes with a special mission of protecting people and ecosystems from harm caused by exposure to these harmful substances. 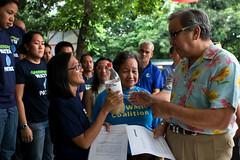 Greenpeace Toxic Campaigner presents to DENR Secretary Lito Atienza a bottle of toxic water collected from the waste collected from the Taytay dumpsite. Organizationally we promote open, informed debate about society’s environmental choices. We use research, lobbying, and quiet diplomacy to pursue our goals, as well as high-profile, non-violent conflict to raise the level and quality of public debate. Such can be said of the event that we did yesterday, we did a direct action in order to ignite well informed conversation around the issue of dumpsites. Conversations are the ideal form of communication in some respects, since they allow people with different views on a topic to learn from each other. Below is an interesting conversation between a concerned citizen of Taytay who wrote to Beau Baconguis our resident expert on matters relating to toxic chemicals and water pollution. 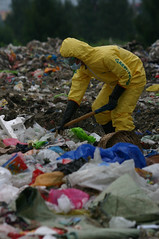 A Greenpeace Water Patrol activist wearing a protective suit shovels trash to take samples from a dumpsite in Taytay. By the crack of dawn, we were already onsite, as we got off our vehicles we were met with a handful of onlooking wastepickers at the dumpsite in Barangay Muzon along Laguna Lake. In no time, the gates of the dumpsite was already locked-shut, with chains and padlocks; and in no time the activists were already busy assembling the scaffolds that will serve as reinforcement to the chains and padlocks that we used to secure the dumpsite’s gates. Greenpeace distributes 35,000 copies of spoof International Herald Tribune in Brussels. Readers of a free copy of the International Herald Tribune in Brussels today may have done a double take when they saw headlines like “Markets Soar on News of Copenhagen Climate Deal” and “Atmosphere Named World Heritage Site.” That’s because the newspaper, datelined six months into the future, was brought to them by Greenpeace and the Yes Men. A group of unidentified aliens visited the Asian Development Bank headquarters during an on-going high-level dialogue on climate and clean energy. The discussion of the need to prevent climate change continues apace. Honestly, I am not fed up about the issue but I’m fed up reading what the deniers have to say about it through the social media. So, I visited some blogs containing other topics to somehow get off from the usual blogs that I follow. After browsing a couple of blogs, I came to stumble upon a quote that’s quite striking. It says, “You cannot f*ck the future, sir — the future f*cks you.” It came from a theology blog but then upon reading the quote, the issue on climate change began crawling inside my mind. Though I’m not sure of what the quote’s context is, I came to concoct my own understanding of it. Hell yes, nobody can mess up with our future here in this planet but I guess the future itself will eventually give its final say whether we’re going to have a f*cked up one or not. In my humble opinion, what we need to do now is to welcome the choice of a solution that might actually motivate some action for once, even on alien’s method, rather than standing vainly in its stead. The final installment of a trilogy is out today. The last of the three Reasons to Believe films narrated by the charming and talented Ms Susan Sarandon has been released – ‘Reasons to Believe: Servers‘. These films give us three out of an endless list of reasons to believe that an Energy [R]evolution is possible and necessary to change our energy habits and reduce emissions contributing to climate change. This week, Shell paid $15.5m to the Ogoni people in Nigeria, an out of court settlement after a 13 year struggle. I read that Shell’s lawyers apparently once said that Shell would only settle when “hell freezes over” and they were “skating on it” – (perhaps that explains why Shell is now the most carbon intensive oil company on the planet – a desperate bid to keep hell nice and cosy).